It's no secret, I think maternity clothes are expensive. I mean, they aren't expensive if you could wear them for longer than 4 months, but the chances of that happening are slim....making them expensive. I don't think $30 for a dress or $24 for a blouse is expensive until I realize that I will wear it from Sept-January and then pack it away until next time. 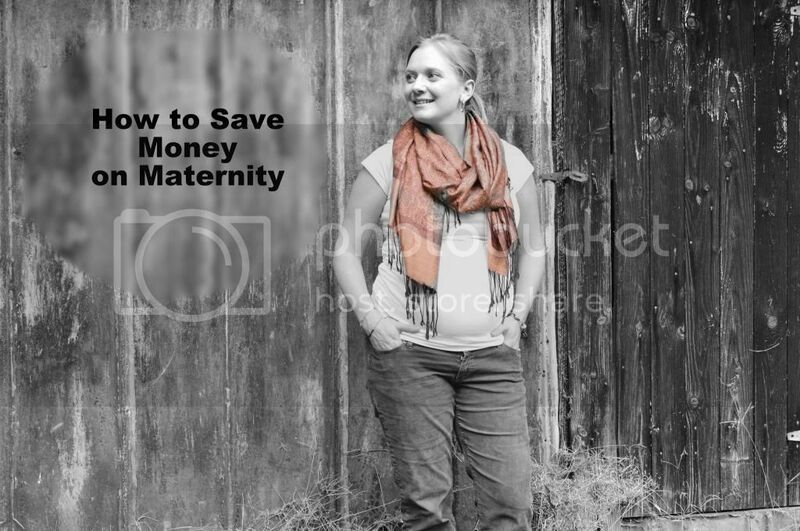 Throughout my pregnancy I have saved money on maternity in lots of ways while still feeling like I have a decent, stylish wardrobe and I thought I would share them with you so that you can do the same! Beg, borrow, and...okay don't steal. But really, ask your friends that have already had children if you can borrow things from them. I was so blessed by my friend, Leslie. She offered to let me borrow everything she had from her pregnancy. What is really important though is making sure you borrow the things that you may only wear once or twice throughout your pregnancy. I'm talking about a dress for a wedding you are going to or a pair of dress pants for a church event. If there are things you don't consistently wear in your normal day-to-day, but find you need them once or twice throughout your pregnancy, ask someone before you go buy something. Yard Sales (including online): I don't know about your area, but online yard sales (on Facebook or otherwise) have taken our area by storm. My mom and I have purchased so many of my maternity staples off sites like these. Most people are willing to let you come look through what they have before committing and you can pretty much purchase items in the same size once you know what your size is. Most of my jeans and tops have been purchased for $5-$10 off these sites. I've gotten many items from Motherhood Maternity, Liz Lange Maternity for Target, and a Pea in the Pod for fractions of the original price; prices I wouldn't have been able to afford in store. Consignment Shops/Sales & Thrift Stores: Ask other mothers you know about consignment shops and sales around your area. Our area has 3-4 decent consignment sales (where you can sell you own items, too) each season throughout the year. Many of them have stuff for your babe, but some even carry maternity. I have purchased several maternity items at thrift stores as well. In fact, I had pretty much figured I wouldn't find anything decent at the thrift store I frequent most often and, boy was I wrong. Each item in this thrift store is $2! I've purchased Old Navy corduroys, a Motherhood pencil skirt, and several sweaters for $2 - you can't beat that with a stick. Sales and Clearance Racks: I have walked into some stores one time and not returned due to prices, but several of my girlfriends tell me that they run amazing sales. I know that often Old Navy, GAP, and Destination Maternity give customers an additional 25-30% off even sale prices. Target has been a great resource for me. Unfortunately, they mix their maternity clearance in with their regular clearance, but if you have the time and you're willing to dig, you can find great deals in there. I recently purchased a t-shirt for $4 and I got a black maxi skirt for $13. Don't judge a store by its cover. Here in NC we have a store called Burke's Outlet, very similar to TJ Maxx or Marshall's. I had been told it was a "dump." I walked in there one day after yoga class just to see what they had for maternity or if they had any at all - it is not a dump! Maybe to someone who hates the hunt, but to someone who doesn't mind it, it is a treasure trove. I've purchased several tops from there that are not maternity that I am still wearing and they had an entire rack of maternity clothes. Even Walmart has maternity clothes online now! Don't be afraid to look outside the maternity section. Just last weekend we went to the farmer's market and everything I had on was non-maternity that I already had in my closet before getting pregnant. I've worn outfits to work that did not have a single maternity piece. The style today for many blouses is loose and flowy which makes them work even with a bump. My jeggings all have enough stretch in them to still be worn normally and my skinny jeans work just fine with my belly band still. It's hard not to get excited about having a bump and wearing maternity, but keep in mind you might still have many items in your closet that work for you. I've been wanting a pair of skinny jeans, but I keep putting it off knowing I can still wear the ones I already own. Coupons. I use coupons in my everyday life. I find them online when I'm shopping and I use them in the grocery store every. single. time. Just last week I saved $26 on our groceries using them. Personally, the time it takes to cut them out is worth the money saved to me. I have been able to use coupons on several items of maternity (as well as items for babe, but that's another post). If you don't already have the Target app downloaded on your phone, do it NOW! I save anywhere from $5-$10 per trip using that app. It constantly has deals like save $5 on a $20 maternity purchase - including clearance items. I've walked out before with almost $50 worth of maternity clothes for $15. Zulilly is quite possibly the best site I've found. It runs great deals on maternity items, things for kids, excursions, etc. Motherhood and Destination maternity often have sales on there as well as PinkBlush Maternity. Definitely click on that link and sign up! You won't regret it. What have you done to save money on your wardrobe? I'm in your boat. Too expensive! But we need clothes. I've basically done the same - hit up clearance and sale prices with extra percentages off. I bought some tops from old navy online when they had a big sale with an additional 30% off early in my pregnancy. It worked out to like $7 a top! I didn't need the tips then and I'm just getting into them now but I know of I bought them now I'd be paying a lot more. I also hit up target this weekend and they had fantastic clearance stuff (I needed a dress). And I still wear my own loose tops. With winter coming too I can still wear cardigans that I own. Just not buttoned!! I agree, maternity clothes are expensive. I did recently splurge and buy some things from Old Navy with a coupon I had. I had $90 worth of clothes but with the coupon only paid $50! Sadly the 2nd time around my jeans are not quite fitting me the way I wish they would so I had to break down and buy some! Thanks for these fabulous tips! !